Winter gales around the coasts have claimed many lives of local fishermen. A loss often described as “the price of fish”. Today’s fishermen have to battle against Government policy, quotas and de-commissioning. Fifty years ago the fishermen’s main adversary was the weather! 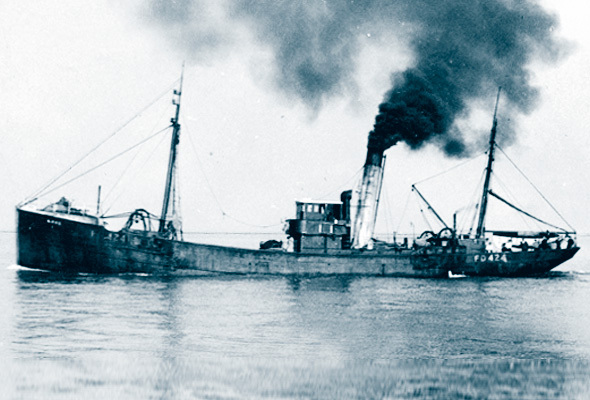 And it was into an horrendous storm that the Fleetwood trawler Lois sailed to her doom in January 1947. Her crew had spent a happy Christmas ashore and the Lois was back fishing after being released by the Admiralty from war duties as a minesweeper. Skipper George Smith of Oxford Road, Fleetwood, had sailed in Lois since she resumed fishing 18 months previously. But that New Year trip was Skipper Smith’s last. Although all his crew was rescued the skipper lost his life in the tragedy of Iceland. It was on Sunday, January 5th that the 111-ton trawler – built in 1917 – struck a rock and foundered as she reached the fishing grounds off the South West coast of Iceland. The crew were thrown around as the trawler struck the rocks a short distance from the shore. Distress rockets were fired and within minutes help was on the way. A rocket-launching party fired a line which landed on the deck. The crew were brought safely to shore. A crewman later said, “We had all got away by breeches buoy and the skipper, who had remained to the last, was clutching the rigging ready to get into the buoy. “As we watched a huge wave smashed against the side of the trawler and he disappeared. Survivors described a terrific blizzard with mountainous seas as the trawler hit the rocks. It was believed the skipper either slipped from the rigging or the breeches buoy as he was being brought ashore. Many of the 15-man crew didn’t realise at first that the skipper had drowned. His body was later washed ashore. The body of Skipper Smith, who was 44, was brought back to Fleetwood aboard an Icelandic cargo ship. Six of his crew acted as bearers at the funeral service conducted by Mr H Howes of the Fisherman’s Mission. Persistent gales and high seas completely destroyed the Lois (owned by Fleetwood Steam Fishing Co) which was smashed to pieces on the rocks. Lois’ crew was; Mate Harold Kaiser of Blackpool; Chief Engineer Micheal Hearty of Garfield Street; Second Engineer Christopher Bond, Lingfield Road; Bosun Mark Trott, Aughton Street; Deckhands Collin Hunter, Lowther Road; John Barratt (the skipper’s brother-in-law) of Arthur Street; George Harrison, Hatfield Avenue, R Reeve, Rutland Avenue, Joseph Brunt, Shakespeare Road, Phillip Whur, Beach Road, William Greaves of Preesall and Max Wilson of Blackpool. The Cook was H Scott of Warrenhurst Road and Firemen James O’Dea, Blackpool and J Connolly, Kemp Street. First published in Life in Fleetwood issue 44, spring 1997.